A research review in the American Journal of Gastroenterology recommends that those suffering from irritable bowel syndrome (IBS) be genetically tested for gluten sensitivity intolerance. 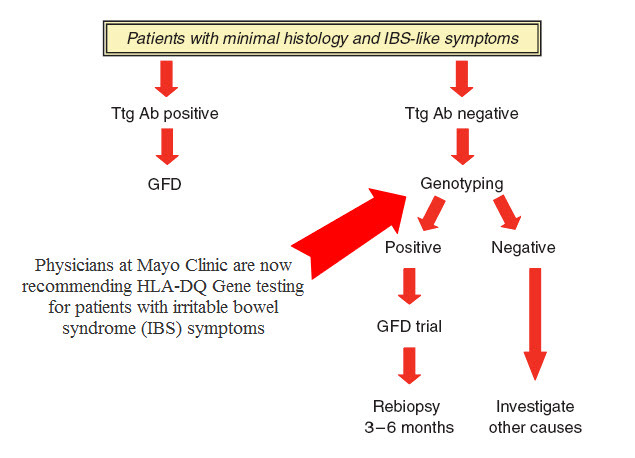 The Review discusses the role of diet as a contributing cause of IBS symptoms. The authors of the paper further state that the classic signs of celiac disease are often absent for those suffering with IBS even thought gluten sensitivity is the culprit. Source: Am J Gastroenterl 2009;104:1587-94. This research paper is a major breakthrough in the advancement for gluten sensitivity recognition. Traditionally IBS sufferers are told to “eat right and limit their stress”. Irritable Bowel Syndrome typically manifests as symptoms of gut pain, bloating, gas, and loose bowels. Endoscopic and other common diagnostic gastrointestinal tests are most often negative leaving people without answers. Medical treatment of IBS is largely unsuccessful. Food intolerance, food allergies, and infections are the most common contributing factors in the development of irritable bowel symptoms. Think about it, we bathe the gastrointestinal tract with food 21 times per week. That food is full of chemicals, viruses, bacteria, etc. Why many doctors completely ignore this is beyond me. Common sense dictates that it would be prudent to investigate food as a contributing factor to gut disease. If your doctor hasn’t or has refused to evaluate these areas, find a functional medicine doctor who will. If you haven’t watched this video on gluten sensitivity, I highly recommend you do so now as gluten is a major cause of IBS. If you would like to be genetically tested for gluten sensitivity and your doctor won’t help you visit this link and you can get a home test kit sent to you. Sign up for our free weekly updates here.